At the 2016 Geneva Motor Show in March, Fiat introduced the Fiat Tipo 5-door (hatchback), successor to the Fiat Bravo. 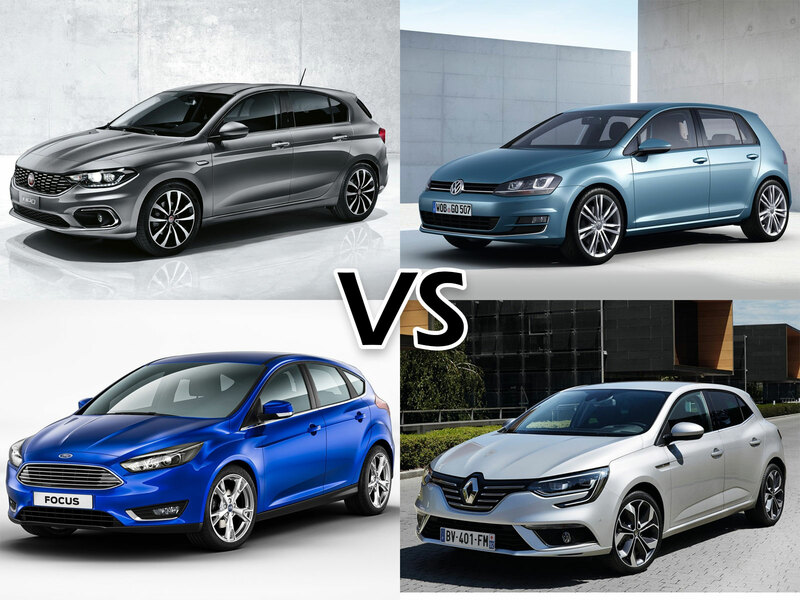 Here's how it compares with its popular European rivals VW Golf and Ford Focus and the fourth generation Renault Megane that arrived late last year. The Fiat Tipo 5-door measures 4,532 mm in length, 1,792 mm in width and 1,497 mm in height, and has a wheelbase of 2,636 mm. The VW Golf is 4,255 mm long, 1,799 mm wide and 1,452 mm tall, and has a 2,637 mm-long wheelbase. The Ford Focus measures 4,360 mm in length, 1,823 mm in width and 1,469 mm in height, and has a wheelbase of 2,648 mm. The Renault Megane is 4,359 mm long, 1,814 mm wide, 1, 447mm tall, and has a 2,669 mm-long wheelbase. The Fiat Tipo 5-door is offered with 1.4- and 1.6-litre petrol and 1.3- and 1.6-litre diesel engines. The VW Golf is available with TSI petrol engines with displacements ranging from 1.0- to 1.4-litre, 1.6- and 2.0-litre TDI diesel engines and a 1.4-litre TGI flex-fuel (petrol-CNG) engine. The Ford Focus can be had with EcoBoost/Ti-VCT petrol engines with displacements ranging from 1.0- to 2.0-litre, 1.5- and 2.0-litre TDCi diesel engines and a 1.6-litre Ti-VCT LPG flex-fuel (petrol-LPG) engine. The Renault Megane is available with 1.2- and 1.6-litre TCe/SCe petrol and 1.5- and 1.6-litre dCi diesel engines. Transmission choices for the Fiat Tipo 5-door include 5-speed manual, 6-speed manual and 6-speed automatic. The VW Golf's transmission choices include 5-speed manual, 6-speed manual, 6-speed DSG dual-clutch automatic and 7-speed DSG dual-clutch automatic. The Ford Focus's engine can be paired with a 5-speed manual, 6-speed manual, 6-speed automatic or a 6-speed PowerShift automatic transmission. The Renault Megane's engine can be linked to a 5-speed manual, 6-speed manual, 6-speed EDC dual-clutch automatic or a 7-speed EDC dual-clutch automatic transmission. The Fiat Tipo 5-door is priced from €15,900 in Italy. 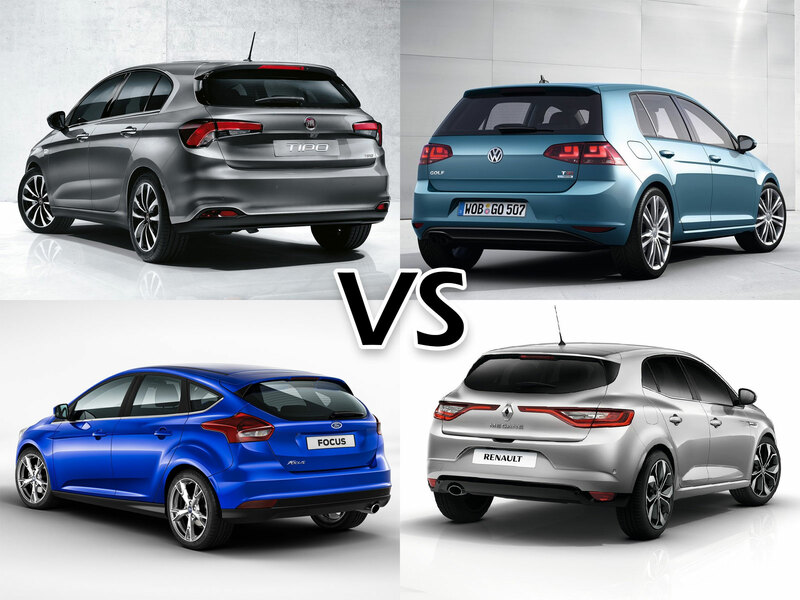 The VW Golf and Ford Focus are priced from €17,850 and €16,450 respectively in Germany, while the Renault Megane is priced from €18,200 in France.